What was your favorite Dark Days meal? 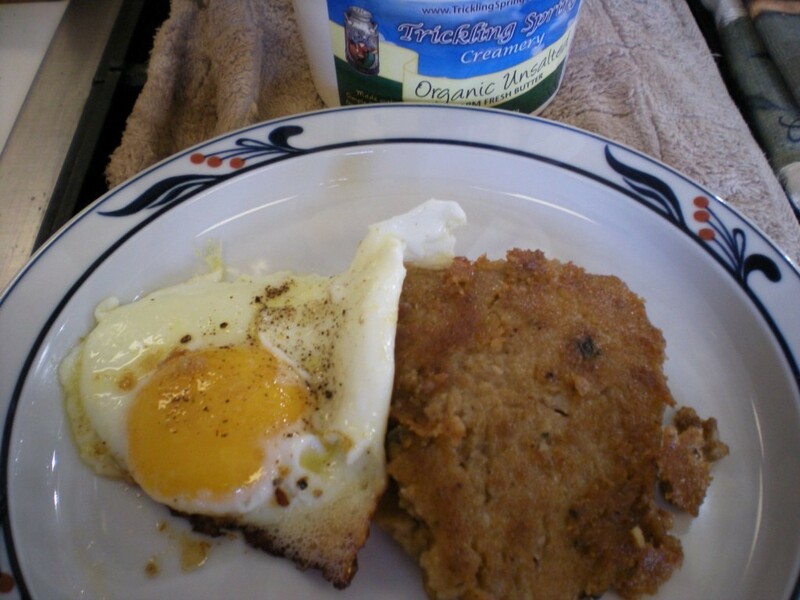 Annie (MD) from AnnieRie Unplugged is turning into her father, but she’s blaming it on Mark Bitman (you’re going to have to read her post) She made a local version of scrapple for her breakfast challenge. Using cornmeal, local sausage and fresh sage from her garden her scrapple took shape. She made it the day/night before and then cut it into slices and fried it along with her local eggs the next morning. She has some advice about the recipe, so head over to her blog to read more and see her local resources. Annie (MD) from AnnieRie Unplugged has also put together a post summarizing her Dark Days Challenge experience. It is really fun to read about what she learned and about the new resources she found in their area. She also touched on her highlights throughout the challenge and about learning to work with some vegetables in a different way and being more creative. Hear over to her post to read more! It is worth your time. 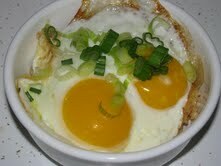 Susan (VA) from Backyard Grocery made some fantastic baked eggs. But not just any baked eggs, she made cups out of bacon and filled them with sautéed radish greens and mushrooms and then topped them with eggs and baked! 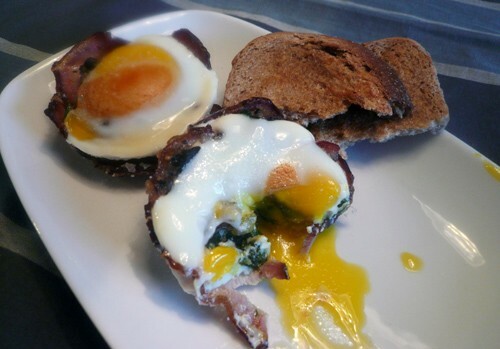 Her baked eggs look wonderful; love that little twist with the bacon cup. Susan also talks a bit about how the DDC affected her. Going in, thinking this would be a hard challenge and coming out realizing that she is fortunate to live in an area that produces a variety of whole foods – year round. She has learned a lot about what grows seasonally in VA. Visit her blog to read more! Rebecca (VA) from Eating Floyd is cooking breakfast Appalachian Mountina-style and biscuits are a must! To go along with the biscuits she made a milk gravy loaded with local flavors. She used wild garlic paste, serrano peppers from the garden last year and a bit of bacon fat. 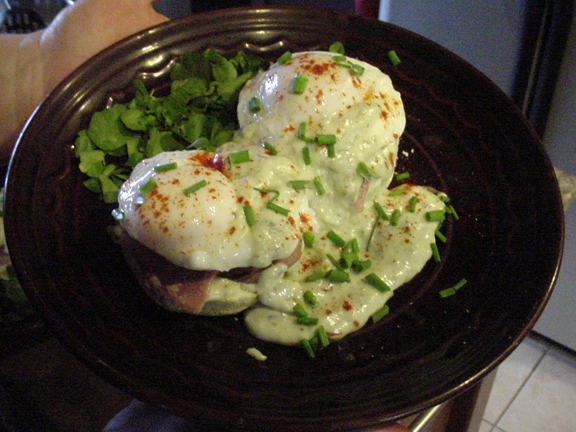 On top of her biscuits she put some salty country ham and poached eggs, topping it all off with the flavorful gravy. Stop by her blog to read about it all and see her local resources. Even though Liz (VA) from Family Foodie Survival Guide cooked up a nice breakfast last week she still cooked up breakfast for this weeks challenge. 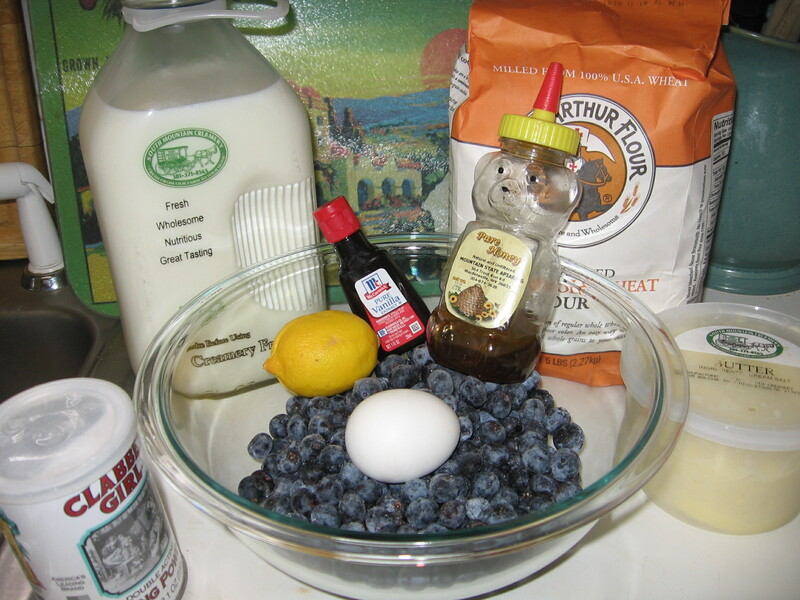 She had some blueberries in the freezer and used those to create a luscious blueberry pudding cake. 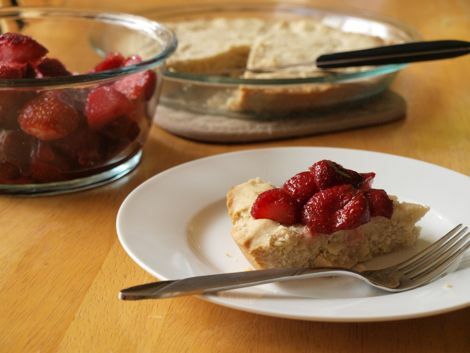 She adapted the recipe to use more local ingredients – she used local honey and flour. The beautiful breakfast was served with some local bacon and apple cider. Head over to her blog to read more. Jessica (SC) from Eat.Drink.Nourish. is not much of a breakfast person, so this “breakfast” was more of a brunch that really turned into dinner. She is excited her local spring CSA is starting up again and many small farm stands are starting to open up in her area. 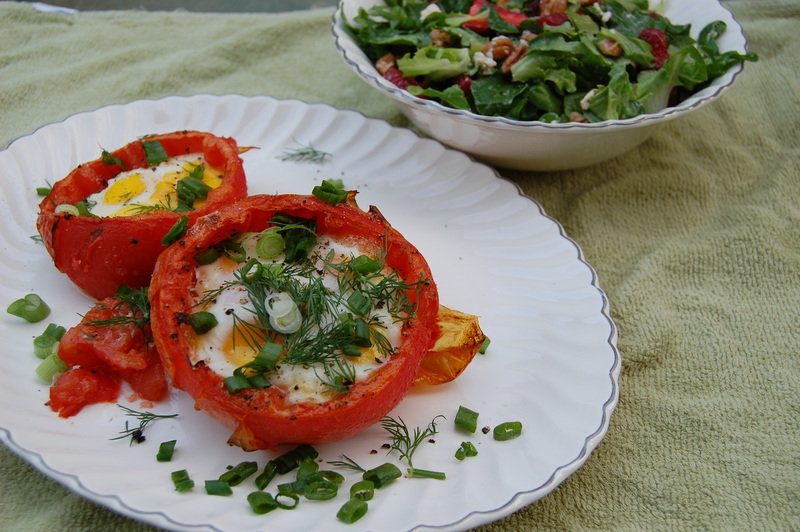 She made roasted egg stuffed tomatoes garnished with fresh dill, spring onions and served with strawberry, pecan and blue cheese salad. That sounds good from Breakfast, Lunch or Dinner to me! Head over to her blog and read more about her meal and local resources. 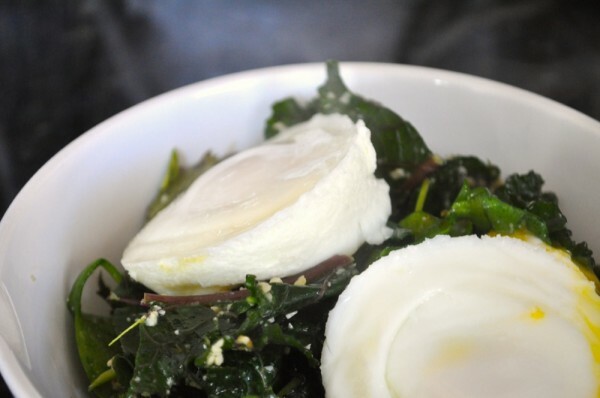 Eat Local 365 made a fabulous looking Dark Days breakfast for the challenge, who doesn’t love poached eggs over greens? As the Dark Days Challenge comes to a close, it is incredible to look back to the beginning in November and think about all the “dark days” ahead of us all. To think about the nourishing winter foods that store well and get us through the winters. Many participants had access to year-round farmers markets; buying seasonal vegetables that were grown in their area. Other participants relied on what they produced in their gardens and canned and froze to use throughout the winter. Other participants had beautiful winter gardens of their own. 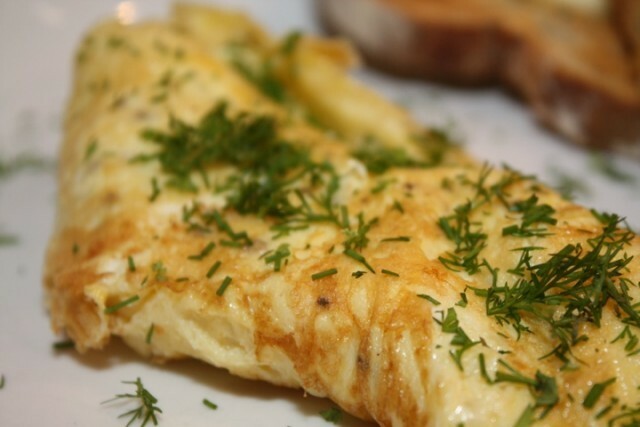 Did you cook a local breakfast this week? Tell us about it and share a link. This week the Dark Days Challenge participants to a Breakfast Challenge. It is said that breakfast is the most important meal of the day. Let’s see what the WEST is making for breakfast this week. Join us next week to see what the EAST participants brings to the table for the Breakfast Challenge! 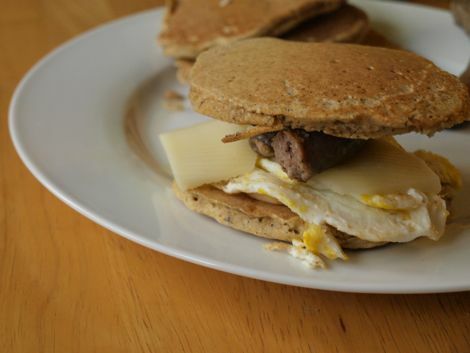 Julie and Eric (CO) from d.i.wine and dine prefer savory breakfast treats, but decided to go the sweet route for this weeks breakfast challenge meal. They made a beet and carrot cake (heavy on the local beets) and used egg replacer and soy yogurt to make the recipe vegan. The recipe went together well using 100% local whole wheat flour too. 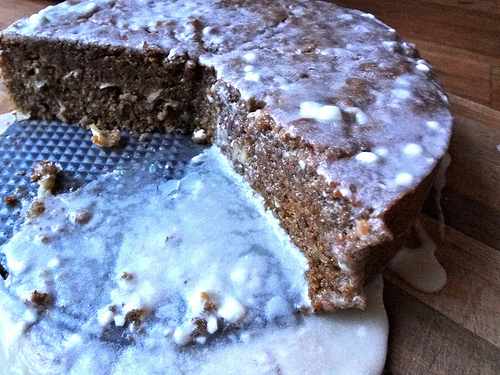 Stop by their blog to read more about the breakfast challenge cake and see the recipe. Teresa (CA) from Not from a Box made up two breakfast options for this weeks challenge. She prefers a savory breakfast over a sweet one any day. First up is a “wallet egg.” What the heck is a “wallet egg?” Well, it looks wonderful, sounds wonderful and is easy to make. I won’t give away all the secrets, but basically take eggs, rice and some green onions….now head over to her blog to read more. 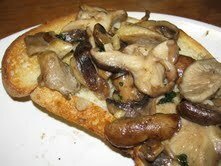 For Teresa’s second breakfast option she has made mushrooms on toast. I am a big fan of things “on toast” so this one is right up my alley. She starts by sauteing up some local shitake, oyster and cremini mushrooms (in local olive oil). You can use a splash of local beer or wine if you have it. Sprinkle in some fresh chopped parsley – don’t forget the toast. Stop by her blog to read about her local resources and more. wow! The breakfast challenge for the PacNW was tackled by only one: Methylgrace. Frankly, I (the recapper) have been remiss in reminding my blogging neighbors about our challenges, and have been experiencing some major challenges of my own – including being kicked out of WordPress with no explanation or chance to query or appeal to the ‘staff.’ Methylgrace captures so much of what myself and several other bloggers have been feeling during this challenge in her breakfast post. This post was just so great. I wish everyone would go and read it. Right now! I can’t really blurblet it, as it deserves complete reading. 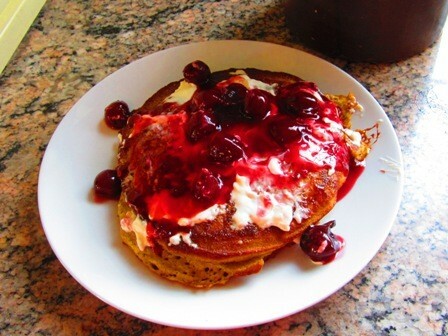 So please head over to her blog, drool over her breakfast crepes and share with her and with us your feelings on choosing foods in your grocery store, providing meals and money for your family, grappling life as a homesteader, housewife or working mom, and help us answer the questions we’ve been grappling during this challenge. We got a treat and and a breakfast from the errant MNLocavore, and Woohoo got turned around by the calendar, partly because we’re all completely thrown by this strange warm weather, and partly because she was trying to time a St. Patrick’s Day meal with the Challenge. 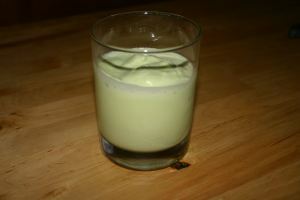 And it’s a good one–a traditional Irish Colcannon, and a homemade, local Shamrock Shake. And I totally don’t see why you couldn’t have that for breakfast. MN Locavore made a shortbread with strawberries (which also sounds like breakfast to me), and wraps up the Challenge with breakfast–whole grain pancakes served as a breakfast sandwich with eggs and sausage. She also includes a wonderful wrap-up list of all her challenge posts. 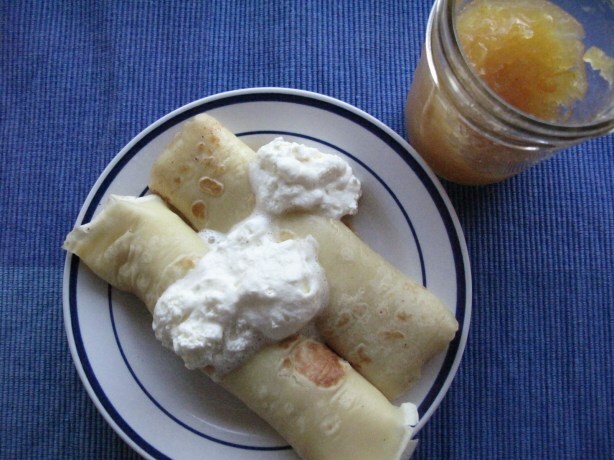 What did you make for breakfast this week? Tell us about it! Earlier today, in our companion post, you can see what the WEST cooked up for the Breakfast Challenge. 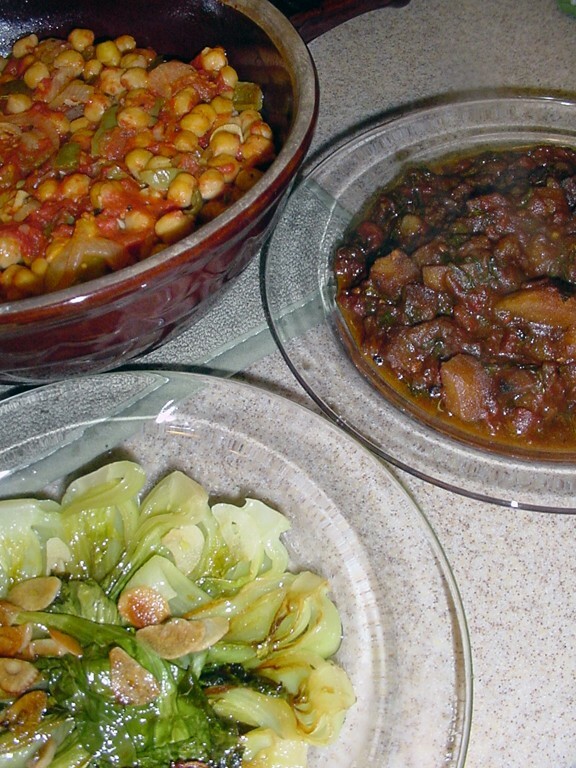 To add to that, here are what the EAST recappers cooked this week for the Dark Days Challenge. 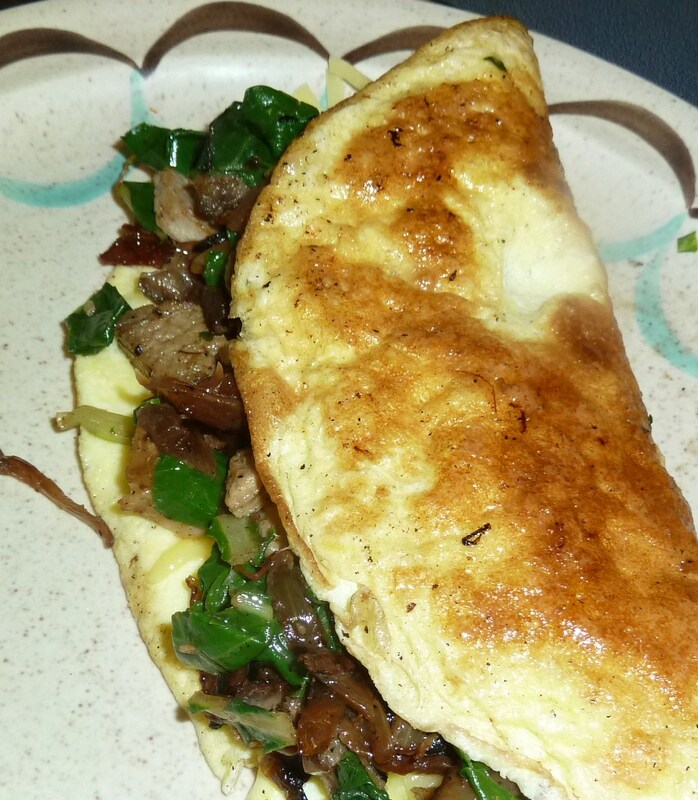 I (Emily from Sincerely, Emily) kept my breakfast Challenge meal pretty simple this week. Eggs are what I usually eat for breakfast, so this is a true glimpse at a normal breakfast, for me, in our house. I have a new local egg source that is a lot closer to me. The other eggs I was getting were also good (and local) but I am happy to find an individual a lot closer to me. That puts a big smile on my face. I also used some chard from the garden and some caramelized onions from the freezer that came from the garden last spring. 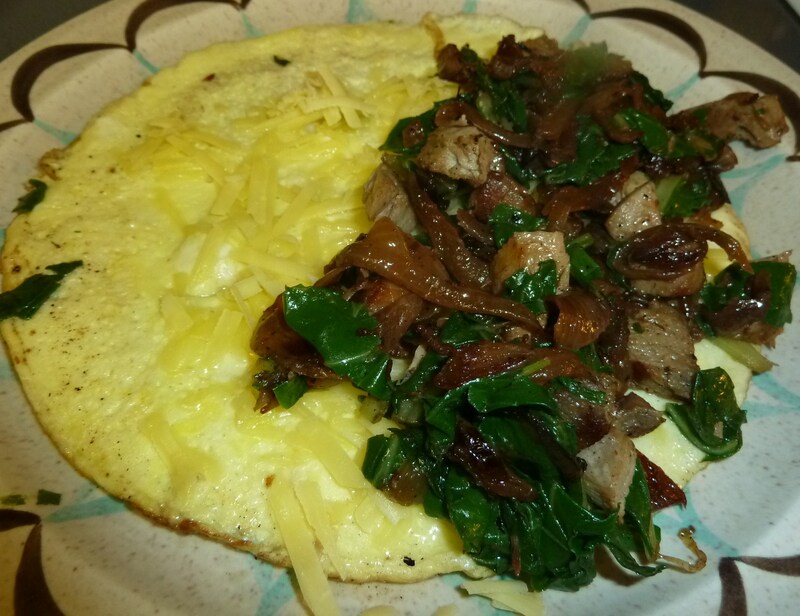 Using some left over pork and some local cheese, this omelet was a perfect breakfast. I am methodically trying to use things out of the freezer to make space for things that we will be harvesting in the next few months. I want to make sure there is adequate space and I always have a tendency to “save” things when I really need to be defrosting and eating them. What is your “normal” breakfast? We are all experiencing more light with longer days and the “Dark Days” seem, almost, like a distant memory. Winter truly isn’t over, although for many of us it sure seems that way. The participants who live in the northern parts know all too well that even though Spring is in the air and days are warming, that it can be a a false sense of security. Snow can make an appearance at anytime, even in May! (Sorry about that) The “dark” from the Dark Days is fading fast, and technically it is Spring now, it is nice to see some participants are still finding local foods in their areas and supporting local farmers. 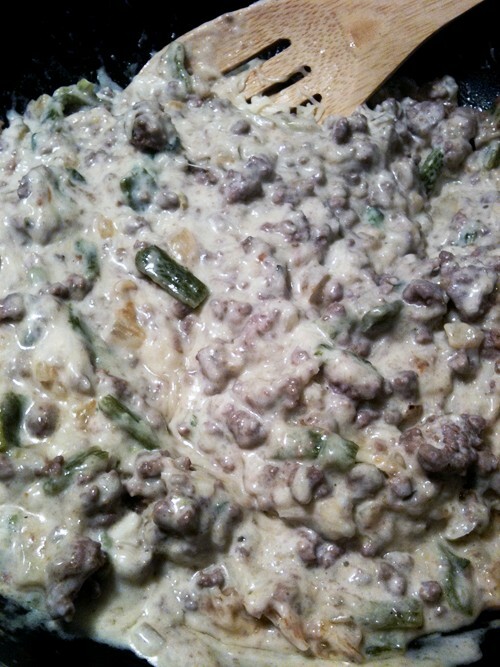 Susan (VA) from Backyard Grocery celebrated St. Patrick’s Day with a classic – venison con queso and chips. Ok, maybe not! Susan did a cooking demonstration this week based on foods found at the market where she did the demonstration. The challenge was coming up with a dish that she could make in one pot. The store carries a lot of local foods and she tweaked hrer recipe based on what was in stock at the store, along with locally made tortilla chips. This recipe can be found in Susan’s published cooked book. You can find out details on her demo along with other information on her blog. AnnieRei (MD) from AnnieRei Unplugged went hiking at the Conservancy trails near her home and guided a group. She planned ahead and started her meal in the crockpot before she left home. 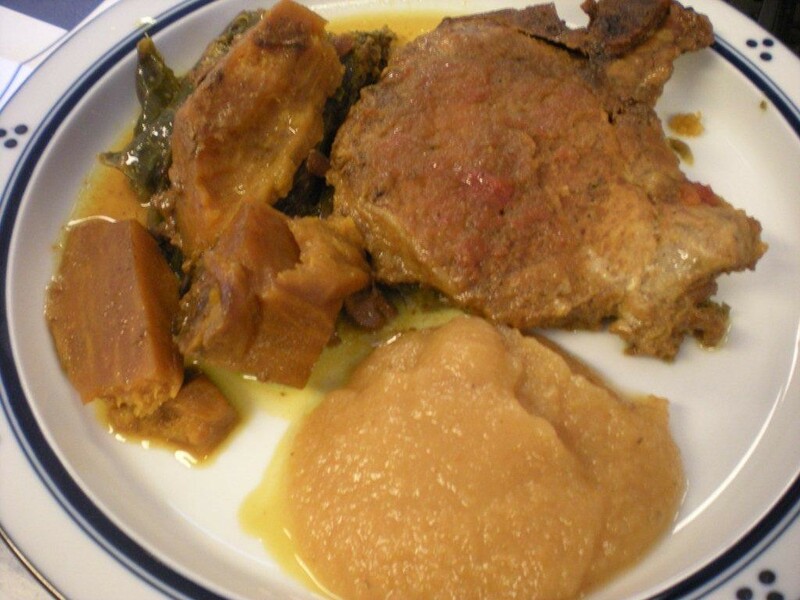 She used center cut pork chops in the crockpot with collard greens, sweet potatoes and a sauce made from local ingredients. She used homemade turkey broth in the crockpot also. All local. All good. Head over to Annie’s blog to see all the great places she found her local ingredients. Victoria (MD) from The Soffritto was inspired by an Epicurious recipe she saw. 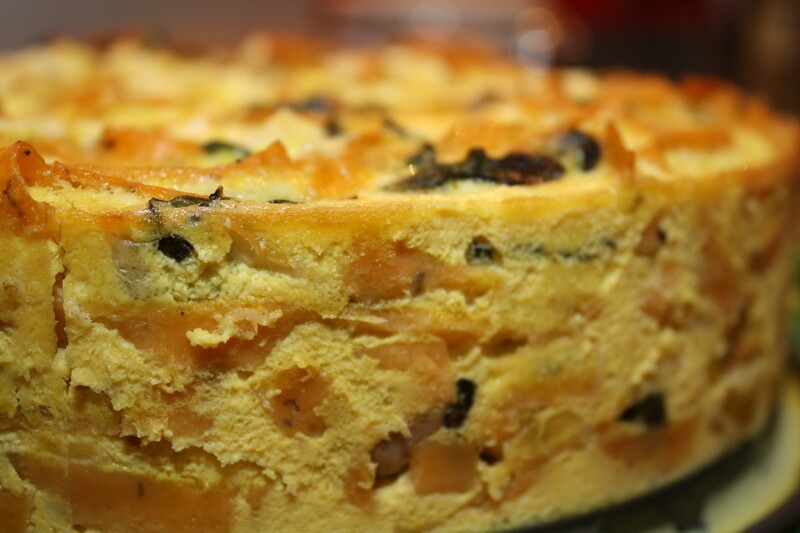 She had all the local ingredients on hand and made a beautiful egg noodle torte. She used oyster mushrooms, chard, basil egg noodles, eggs, milk and dill cheddar cheese all from local resources and her torte is beautiful. This recipe is perfect, because you can switch out many ingredients and make it your own, using what ever is in season in your backyard or at the farmers market. Stop by Victoria’s blog to see the recipes and her resources. Rebecca (VA) from Eating Floyd is in the same situation as many of us with warm weather and the itch to plant. She is busy working outside and looked to her preserved items from last year to make up a quick meal. She used a jar of home-canned asparagus soup and also made up a bed of spinach to hold scoops of roasted red pepper hummus and chicken salad. 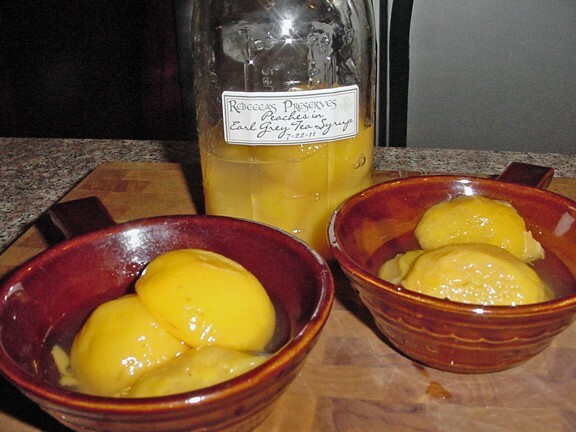 To finish the meal with a nice sweet treat, she opened a jar of canned peach halves in earl grey tea syrup. 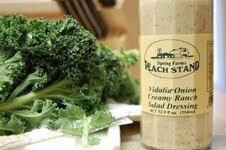 Visit her blog for recipes and local ingredient information. Jessica (SC) from Eat.Drink.Nourish. has her spring garden already planted and is looking forward to what it will bring. This week she talks about her experiences with the challenge and how it has changed their family (in a good way.) They fired up the grill this week and made grilled fillets over natural (wood) charcoal and served it with a kale salad. Jessica has eaten kale many times, but this is her first raw kale experience and she loved it. Head over to her blog to read more about her DDC experience and her local ingredients. Once again, I find myself incredibly inspired by the beautifully written posts from Karen (NJ) over at Prospect: The Pantry . I also find myself jealous that she can get local saltwater fish over on the coast. 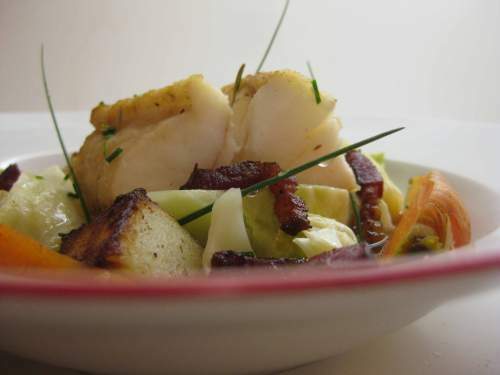 Her first post was a birthday dinner of Monkfish on Braised Cabbage that looks delicious; I love the way she garnishes things! 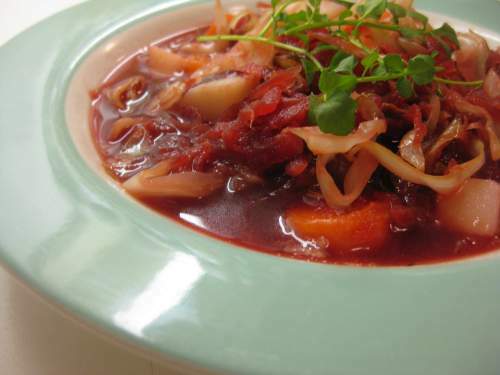 Her second post, Oxtail stock with Borscht , is a great account of her exploration of oxtail stocks and oxtail stew! She has been a fantastic Dark Days participant and I fully intend to keep an eye on her blog from this point on, as it always stirs me with it’s beautiful photos and unique recipes. We are on the home stretch for the Dark Days Challenge with just a few weeks to go. March seems to signify Spring with longer days and the weather warming. Be sure to take a look at the meals from the WEST in our companion post today. I (Emily from Sincerely, Emily) decided to dig into the freezer and pull out some the Southern-type peas (zipper peas, cow peas, crowder peas) that I have from the garden last summer. Those peas grew really well considering how dry and hot it was last summer. I will plant more this spring! 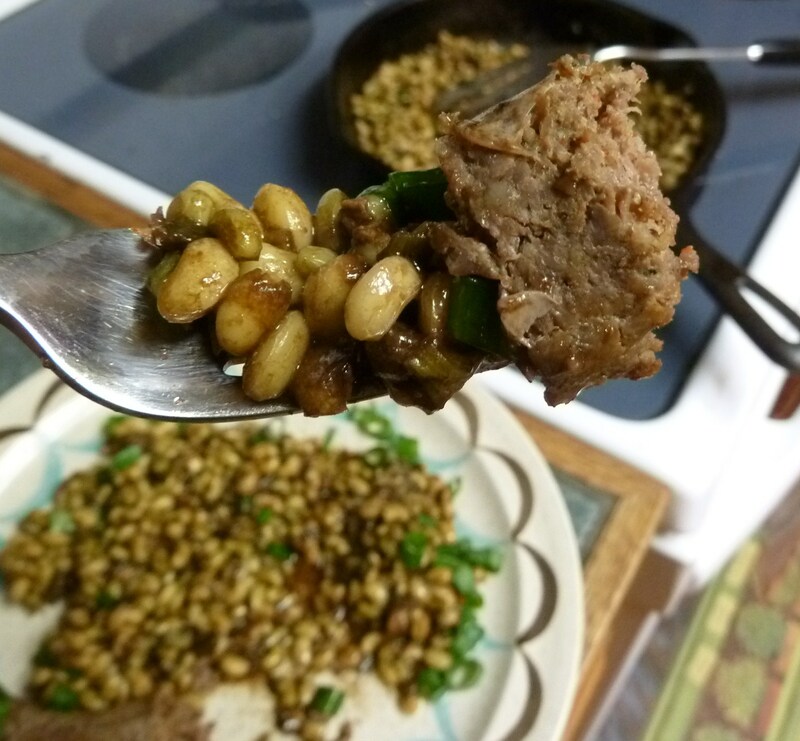 This is the first time I have eaten these Southern peas as a side dish. Up until now, I have always thrown them in a soup or a stew and they have been great that way. Even though I froze them fresh, raw and uncooked, they were still quite firm after I sauteed them. Next time I will cook them in some water or steam them to see if they will soften up prior to sauteing them. The sausage came from a local heritage pork ranch and they called it a Mexican-style sausage. It have lots of flavor and I will buy it again. My neighbor has so many bunching onions growing right now. They are lush and full and beautiful this year and a great addition to almost any meal we have. Many of his bunching onions will be kept to dry and plant next year. 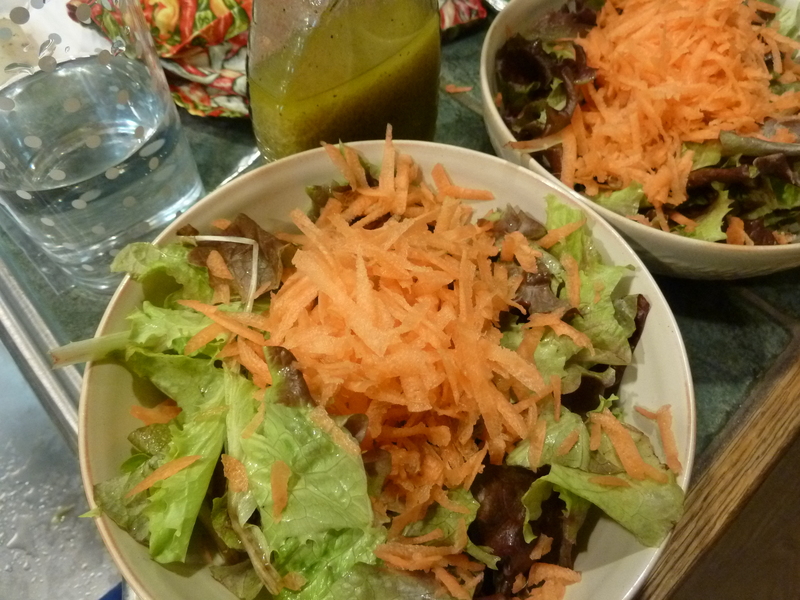 We are eating a lot of salads this time of year. I planted more lettuce than we needed, but it is nice to be able to give some to neighbors and friends as well as enjoy it too. My carrots aren’t ready yet, so I used some carrots from another local farm that I got at the farmers market. They are so sweet and incredible and added so much flavor to the salad. Here at Chiot’s Run things are a bit busy with planning for a possible move, fixing up the house to put in on the market, trying to find a nice little farm 4-5 states away, getting the spring/summer garden going. Add to that two weeks on the road traveling for work and you’ve got a recipe for not much time and needing quick & easy meals. When I get busy like I am I have a tendency to make up a big batch of something which we eat on for a few nights, then another big pot of something gets made up. This past week we enjoyed nachos in the evenings made with venison that Mr Chiot’s got for the freezer, topped with local cabbage braised in butter, home canned tomatoes and jalapeños mixed up into a salsa, local raw milk cheese melted on top, and enjoyed with some local tortilla chip (which are even fried in local sunflower oil). I’m really happy that there are farmer’s around here that have been getting into winter harvesting. I was able to score a few bags of sweet overwintered carrots (since mine are long gone from the pantry). There were cooked up with a venison roast, homegrown potatoes, onions, and garlic. We invited some friends over to enjoy this meal with us, which always makes a meal taste even better! 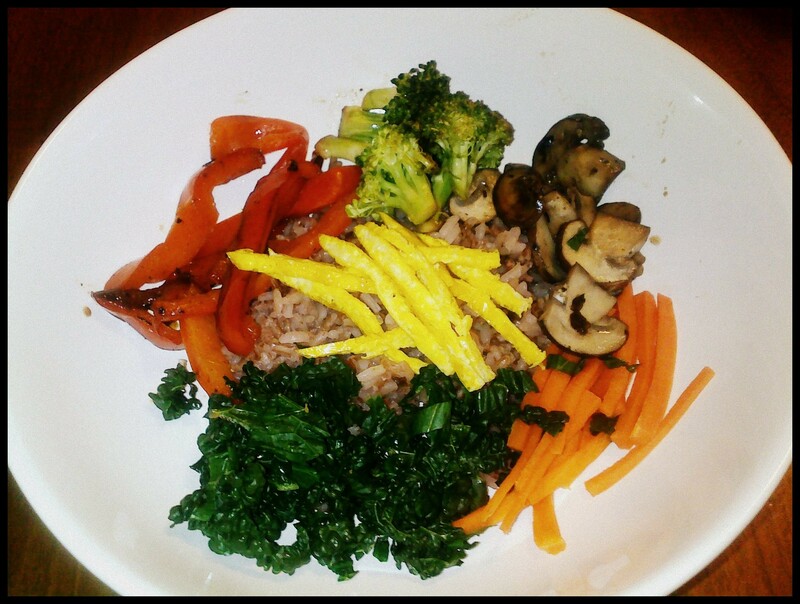 How are your homestretch Dark Days meals coming along?